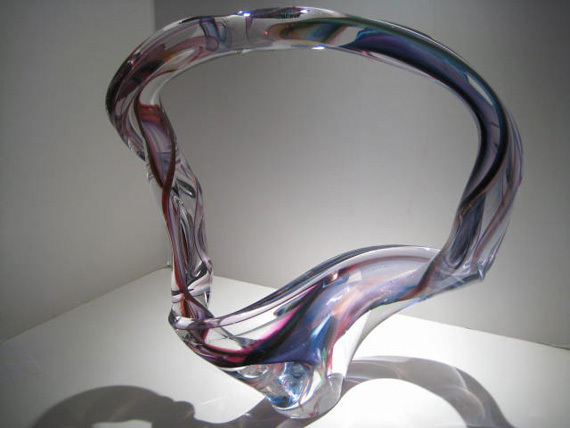 Using traditional glassblowing methods thousands of years old, David Goldhagen creates each piece individually, working with molten glass at temperatures in excess of 2000f. His pieces capture a palette that moves from subtle to bold by the incorporation of bits of colored glass made from various mixtures of metallic oxides and rare earth elements, such as silver, cobalt, gold, copper, dichroics and others. His asymmetrical pods require unusual strength and mastery of technique, harnessing the fiery momentum, climaxing as the piece opens and spins out in one continuous movement. Some of these extraordinary pieces are in excess of 40″ in diameter. Each sculpture up on completion is then annealed (a gradual cooling process), and hand polished. After a careful final inspection, the artist signs and dates his work. His images are viewed as being organic, sensual, fluid and energetic. He draws his inspiration from his surroundings, and captures, on a platter, the glory of a sunrise over the placid lake, or the blooming of an iris, deep within a sculpture; the movement in each piece mirroring the graceful turn of a dancer… the luminous curves of a seashell… the exaltation of the human spirit.